0 (N) Noninducer or anti-inducer"
17a-Hydroxyprogesterone ÇH3 Strong binding 0/+ (N) Anti-inducer"
" An anti-inducer binds to receptor, but will not induce TAT. Therefore, it does not translocate to the nucleus, or if it does it cannot act productively in the nucleus. mafic activity that has been used is that of tyrosine aminotransferase (TAT) in hepatoma cells in culture. These cells are immortal in culture and retain the property of TAT induction by glucocorticoids after transformation. The three groups of agents mentioned reflect glucocorticoid potency in the induction of this enzyme in vitro. The groups of compounds cluster into those described for ligand binding to the glucocorticoid receptor and ability to induce TAT. They are called (1) agonists, (2) weak agonists, and (3) antagonists (Table 10-3). A new series of very high-affinity glucocorticoid agonists-antagonists has been developed by Roussel-UCLAF in France. The structures of these compounds tell us something about the structures of li-gands and the ligand-binding domain of the receptor. Some of these structures are shown in Figure 10-17. For high affinity to the glucocorticoid receptor, the C-11 position needs to be substituted. Substituents around the D ring also increase affinity, but the key seems to be the substitution of the C-ll and also the pattern of double bonds in the A and B rings. It is not essential to have a C-19 methyl if there is a bulky substituent at C-ll. The major sites of inactivation of glucocorticoids are the liver and to some extent the kidney. Enzymes are present that reduce the double bond at C-4,5 of the unsaturated 3-ketosteroids. The product contains either a 5a- or a 5/3-proton, and reduced steroids generally are much less active. The principal routes of metabolism of Cortisol and corticosterone are shown in Figure 10-18A. These are NADPH requiring enzymes, one in the microsomal fraction that produces the 5a-product and the other producing mainly the 5/3-isomer, while corticosterone is converted to a mixture of both products. As shown in Figure 10-18, further reductions or oxidations occur in the 3-ketone, 11/3-hydroxyl, and 20-ketone. Most of the urinary metabolites are gluc-uronides conjugated to hydroxyl groups. Sulfate derivates are also formed, and these often occur in bile as 3- or 21-monosulfates or 3,21-disulfates. 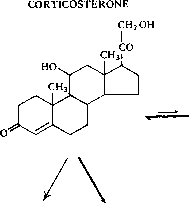 Cortisone (Figure 10-18B) is relatively inactive as a glucocorticoid. When given in pharmacological amounts, it exerts glucocorticoid effects after its reduction to Cortisol, an active hormone. FIGURE 10-17 Structures of agonists-antagonists of the glucocorticoid receptor developed by Roussel-UCLAF. Cortisol is presented for comparison. The number below the structure in parentheses indicates the relative affinity for the glucocorticoid receptor. 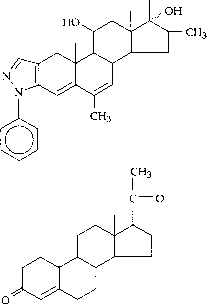 Thus, RU28289 has about 10 times the affinity of Cortisol. These data were derived from Ojasoo, T., Raynaud, J. P., and Doré, J. C (1994). Affiliations among steroid receptors as revealed by multivariate analysis of steroid binding data. J. Steroid Biochem. Molec. Biol. 48, 31-6.
tion, and it may inhibit the side chain cleavage reaction. The 11/3-hydroxylase is a mitochondrial enzyme and would be expected to cause the accumulation of inactive precursors of Cortisol, such as 11 "deoxycorticosterone or 11-deoxycortisol. As a consequence of decreased Cortisol, the long-loop negative feedback by Cortisol on the anterior pituitary, hypothalamus, and limbic system (Figure 10-7) is much reduced, with the result that there is increased output of ACTH by the cortico-trophic cells of the anterior pituitary. 11-Deoxycortisol can bind weakly to the glucocorticoid receptor and has minimal glucocorticoid activity. Measurement of elevated plasma concentrations of ACTH, usually by radioimmunoassay, is diagnostic of hypofunction of the adrenal cortex (Addison's disease). Not only is ACTH the key hormone of the stress humoral pathway, but it is also a growth factor for cells of the adrenal cortex. 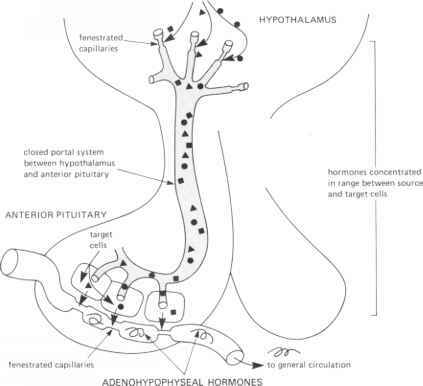 Consequently, when glucocorticoid therapy is used, the hypothalamic-pituitary-adrenal axis is interfered with due to the function of the negative feedback mechanism (Figure 10-7). Such therapy is usually given on alternate days to allow for recovery of the axis.